The parish of Stoke Damerel (occasionally seen spelt Stoke Damerell) was incorporated under a local Act of Parliament for the management of its own poor law administration and provision of a residential workhouse. In 1777, the Incorporation erected a large workhouse on Duke Street. Stoke Damerel Incorporation's local Act status exempted it from most of the provisions of the 1834 Act and the Incorporation (renamed Devonport in 1897) continued in operation until 1930, when the City Council took over the administration of poor relief in Plymouth. By the 1840s, the old workhouse building was proving too small for the needs of the parish. In 1850, the decision was taken to erect a new workhouse at a site almost two miles from the town on the west side of the Saltash Road. The building was designed by Alfred Norman. Completed in 1854, its construction cost £9,600 and was intended to accommodate 500 inmates. Its location and layout are shown on the 1905 map below. The main block, which no longer exists, faced to the south-east and was of three storeys. To the rear was an infirmary block, originally of two storeys but with a third storey added later, possibly in 1898 when £4,000 is recorded as having been spent on building additions. 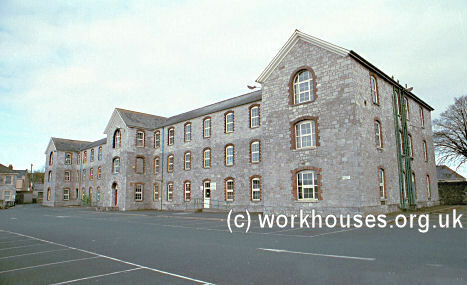 Stoke Damerel workhouse infirmary from the east, 2001. On 26th July, 1866, the workhouse was visited by Dr Edward Smith, a Poor Law Inspector, and Medical Officer of the Poor Law Board. He described the Stoke Damerel workhouse as a new workhouse "admirably situate". He also reported that there is a detached infirmary constructed with a side corridor and having external windows on 1 or 2 sides of the wards. The wards — large, light, airy. Wards for general sick, 2 sick nurseries and VD wards (into which itch cases are exceptionally admitted). There are no separate fever wards. There is a room in which a smallpox case might be placed. There is a foul ward but offensive cases are usually placed in a separate ward. One sick ward for medical and one for surgical cases although the distinction is not strictly maintained. The infirmary has a warming and a cooling kitchen. WCs at ends of building (there are 11). Moveable baths. WCs in garden. Ventilation is chiefly by windows and fireplaces. Vents in floor so small as to be ineffective. Large panes of perforated zinc over each door leading from the corridor, and a lattice work in the corridor allows free ventilation from end to end. There is 1 paid nurse for 120 patients. Number of sick on this day — 115; inmates — 417. After 1930, the workhouse later became Ford House Public Assistance Institution, later renamed the Ford House Residential Home. The main building was damaged by bombing during the Second World War. It stood in ruins form some years and was subsequently demolished to make way for the Ford Secondary Modern School which was erected at the south-west of the site. The former workhouse infirmary building survived and became the Wolseley Home providing geriatric accommodation. It was latterly used as local social services offices but is understood to have now been demolished. The Devonport Union operated a number of 'scattered homes' where groups of children lived under the care of a house-parent and attended local schools. One of these was at 15-16 Cotehele Villas, Stoke. A receiving home for new admissions to the home, Stoke House, on Ford Hill, Stoke, has been the subject of the book Scattered Homes, Broken Hearts by Vicky Norman (details below). From the 1930s, Stoke House became known as Devonport Guardians' Children's Home. Plymouth and West Devon Record Office, Unit 3, Clare Place, Plymouth PL4 0JW. Very few records survive. Norman, Vicky (2nd ed. 2003) Scattered Homes Broken Hearts Written by a woman who once lived at the Stoke House children's home, the book includes the history of Stoke House, and information (including addresses) on other children's homes in Devonport and Plymouth. It also includes chapters written by other inmates of Stoke House.